November started dry and relatively mild. Most outings during the first ten days saw hatches of midge, trickles of Large Dark Olive and short periods of rising fish. It was nice to have the opportunity to do some spider fishing, instead of what tends to be the customary winter task of plumbing the depths with heavy sub-surface offerings. 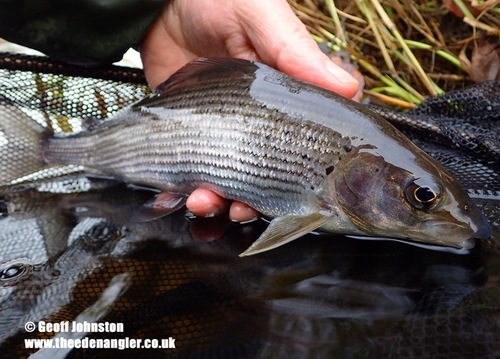 We didn’t get much opportunity to target or learn much about our local grayling when I was younger. We’d pick the occasional one up whilst trout fishing. Usually only one or two per season. Certainly not enough to justify chasing them when our trout season closed. But I did try on occasions. I think the inspiration came from Reg Rhygini’s book ‘Grayling’ – one of many good fishing books in our local library at that time – and from seeing a video of him fishing for grayling on the River Eamont. Many blanks soon put me off…and it was the late 90’s before I had the incentive to try chasing Eden grayling again. They began to return to the Eden and it’s main tributary, the Eamont, in reasonable numbers around 1998. By 2000 the grayling population had increased massively and we were catching large numbers throughout the year. It was great when they returned to Eden and we had good fishing on our doorstep. 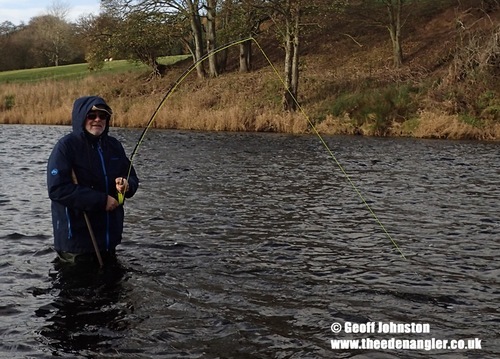 Prior to that time, the only grayling fishing we did was the occasional winter trip into the Scottish borders, down to the Yorkshire dales and onto the Derbyshire Wye. Rather than the occasional trip, our post -’98’ grayling fishing on Eden meant that we could spend many more days on the water and learn more about ‘ The lady of the stream’. Their habits, what they did and didn’t like, their susceptibility to changing conditions and their liking for the surface fly. 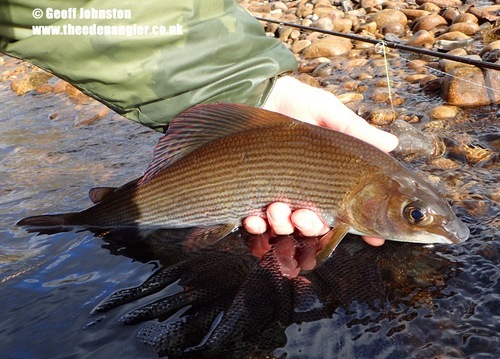 The grayling’s mouth is shaped perfectly for foraging on the river bed. Understandable, I guess, when you think of the barren winter months when surface food of any kind is at a premium. I guess that it’s also understandable – during the winter – why the fish will sometimes be up like a shot to take advantage of any sort of a hatch. 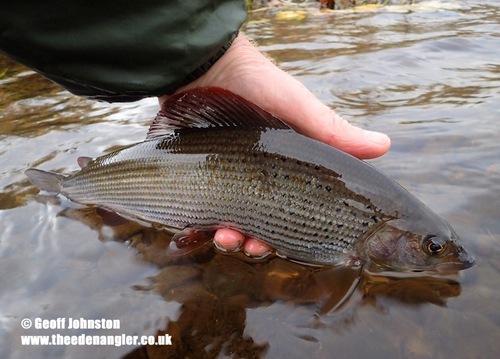 One thing I have learnt over the last 19 years on Eden is that grayling – despite their reputation for being bottom feeders – are pretty free-rising, and that was the case in early November. You could hardly call what we got ‘a hatch’. A handful of olives and a smattering of midge, but that’s all it takes sometimes. Most sessions, depending on starting time, started on the nymph before a couple of splashy rises and the occasional natural were noted. A quick change to a couple of spiders and a light nymph resulted in decent numbers of fish at times and then, if all went quiet, a return to the nymph to end the day. I’m often preaching to clients about the importance of taking note of what is happening around you. And how ringing the changes to suit changing conditions can often pay dividends. One session on a relatively warm mid-November day was a prime example. The day started on the nymph, then a little surface activity prompted a change and spiders did the trick. 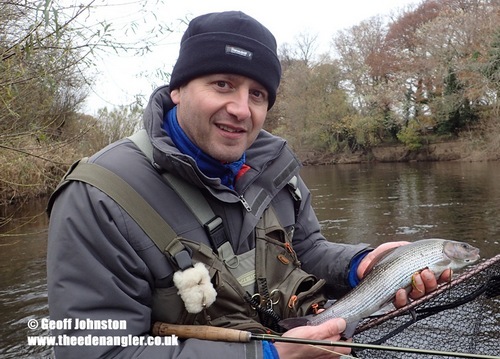 A few fish were midging the flats and they were tempted with a change to size 18 dries. When surface activity ceased it was back to the nymphs….No messing about with leader changes. The turnover and presentation wasn’t perfect. But it was sufficient to cope with quick changes to take advantage of these short windows of opportunity. These sort of things don’t happen often. But I love it when they do. This is what makes our great sport so interesting for me. I’m not interested in going to the river and switching to ‘automatic pilot’. A Salmon on the nymph! It wasn’t only grayling and a few out-of-season trout that took an interest in my spider rig. On one drift an out-of-season salmon took an interest in my point fly; a size 14 beadhead nymph! It’s surprising what will tempt these ‘silver-tourists’, or in this case: not-so-silver. I and one or two of my clients have had quite a few come to nymphs and the occasional spider over the years. The guiding and tuition game can be relatively quiet over the winter, but a few hardy souls manage to brave the elements. It was bitterly cold for Peter and Dylan’s first experience of river fishing. 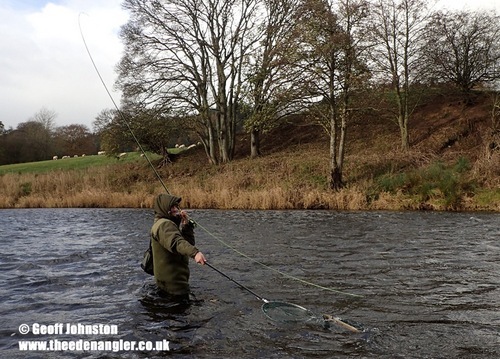 Wading a cold Eden in November was a bit different to their usual stillwater fishing from the bankside. But a few Olives hatched. Fish looked to the surface and both managed some action on their river debuts – and both said that they’d be back for more! The middle of the month saw a return to colder conditions. Phil wanted to hone his Czech nymphing skills and the conditions were ideal for it: nothing on the surface and the fish were keeping their heads down. Rain on the 14th brought a slight lift (50mm) in levels on the 15th. It wasn’t enough to stop the fishing, but the slight drop in water temperature seemed to slow things. I was back to plumbing the depths…. We were back to rain and fluctuating river levels for the final ten days of November. A spell of wet weather through the early hours of the 20th brought the rivers up the following day. They began to drop on the 21st and then we were hit with a deluge on the 22nd. I read somewhere that we had over 100mm of rain in 12 hours. Roads were flooded all over our region and our rivers were rising fast. 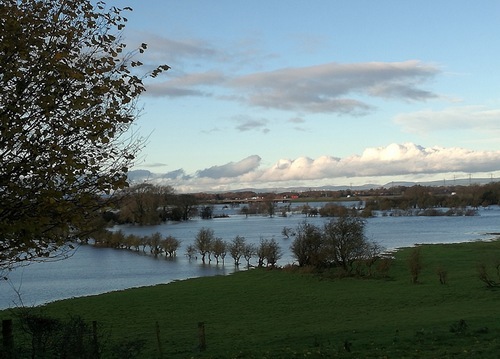 The Eden rose over 3 metres and flooded the fields on the 23rd. It’s surprising how quickly the river drops. 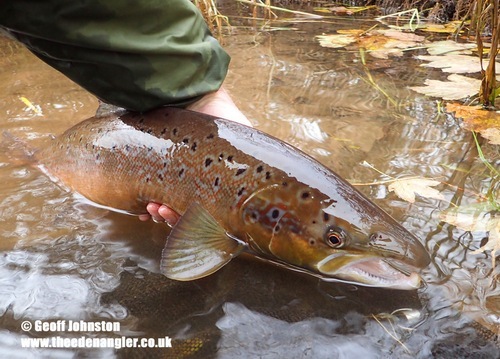 It was fishable – just – by the 26th, and a short session produced a couple of fish, then it rose again on the 27th and that was my November fishing over….